Unemployment levels across the 16 countries that use the euro hit a 10-year high in July, as the impact of the recession continued to be felt. The number of people unemployed across the eurozone region totalled 15.1 million people in July, a seasonally-adjusted rate of 9.5%. This was the worst monthly percentage figure recorded since May 1999. The rate across all 27 members of the European Union was 9% - a total of 21.8 million people out of work. This was the highest level of unemployment across the EU as a whole since 2005. Unemployment increased in July in France - despite it coming out of recession between April and June. Unemployment is continuing to climb in Europe, although the rate of increase is slower than at the start of this year. Spain continues to suffer the most, with almost one in five people out of work in July, closely followed by the Baltic states. The number of jobless in the EU and the eurozone is set to rise throughout the rest of this year as the effects of any economic recovery will take time to filter though to the labour market. Rising unemployment threatens to dampen consumer spending and that could hamper growth in the economies of Europe. France's unemployment rate in July rose to 9.8% from 9.6% in June. Germany, which also emerged from recession in April to June, saw an unemployment rate of 7.7% in July, the same as June. Analysts put both sets of figures down to the usual time-lag seen before employment levels start to pick up once a country has left recession. 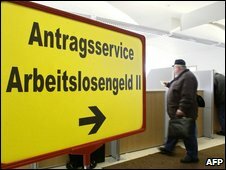 Separate figures on Tuesday from the German Federal Labour Agency showed that German unemployment rose to 8.3% in August. However, its figures are released on an unadjusted basis, and therefore cannot be easily compared to the seasonally-adjusted data from Eurostat. "Even though some eurozone countries returned to growth in the second quarter, and others are likely to follow in the third quarter, we suspect that economic activity will remain too weak to actually generate net jobs until at least the second half of 2010," said economist Howard Archer of IHS Global Insight. The unemployment rate in July was highest in Spain, where it rose to 18.5% from 18.2% in June. Spain's jobless situation is worst among the country's young adults, with 38% of those under 25 now without work. Unemployment remained the lowest in the Netherlands, where it increased to 3.4% from June's 3.3%. Lithuania and Latvia continued to see the biggest rise in the rate of unemployment. In Lithuania it rose to 16.7% in July from 5.8% a year earlier, while Latvia's has grown to 17.4% from 6.9% last year. "July's figures show that eurozone unemployment is now rising at a slower rate, but it will be some time before the labour market really starts to recover," said Jennifer McKeown of Capital Economics. "But as unemployment tends to lag behind developments in the wider economy, we still expect to see further increases in the coming quarters."